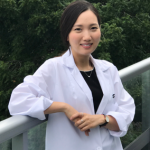 Shannon Youn, H.B.Sc., D.Ch., is a Registered Chiropodist who is passionate about helping others achieve and maintain optimal lower limb and foot health. As an individual who always finds reward in caring for others, Shannon is eager to use the skills and knowledge she’s attained to improve the quality of life of her clients. Shannon graduated and obtained her Honours Bachelor of Science degree from the University of Toronto, double majoring in Human Biology and Animal Physiology. She then continued her education at the Michener Institute of Education at UHN enrolled in the Chiropody program where she graduated with distinction in her class. During her studies at Michener, Shannon gained valuable clinical experience at the Michener Chiropody Clinic, The Anne Johnston Health Station, Newmarket Foot Centre, and Kitchener Downtown Community Health Centre. As one of your primary healthcare professionals, Shannon is committed to providing the best patient-centred care by practicing evidence-based medicine and working toward patient satisfaction. Shannon is skilled and trained in the full scope of chiropody and looks forward to meeting you to assess and treat your foot concerns.